Naniwa Pump Mfg. 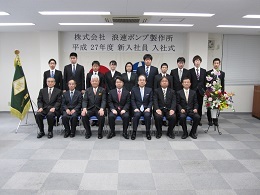 Co., Ltd. held a ceremony welcoming new employees at Osaka Main Office on April 1, 2015. | Naniwa Pump Manufacturing Co., Ltd.
Naniwa Pump Mfg. 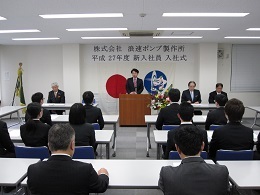 Co., Ltd. held a ceremony welcoming new employees at Osaka Main Office on April 1, 2015. Ten (10) new employees joined the company right after graduating from university/technical school. After the ceremony a small welcoming party was held during which the newcomers introduced themselves, expressing their loyalty to Naniwa and engaging in relaxed small talk communication with longtime Naniwa colleagues.